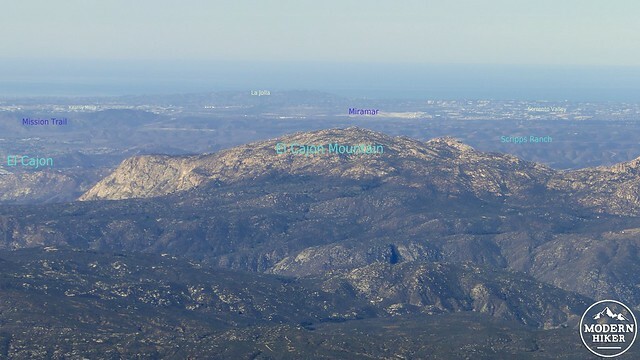 Cuyamaca Peak is the second highest peak in San Diego County. It sits a mere 20 feet lower but is far more accessible than Hot Springs Mountain near Warner Springs. 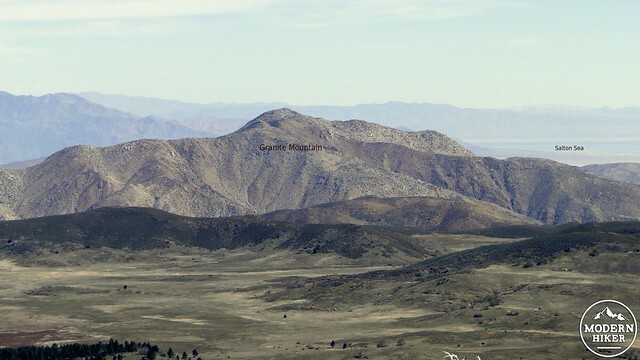 The peak’s 6,512’ summit is relatively modest compared to the behemoths in the San Gabriels, San Jacintos, and San Bernadinos. 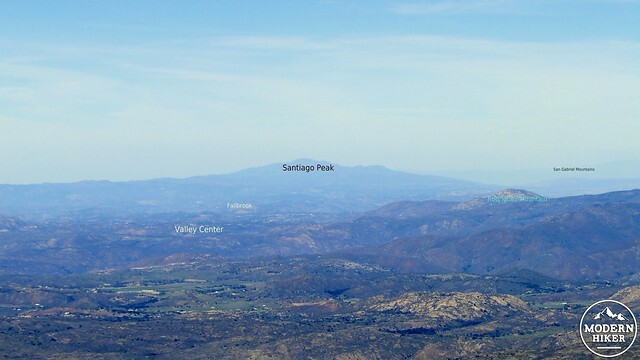 However, Cuyamaca has the honor of being the geographic center of San Diego County, which grants the peak unparalleled views. 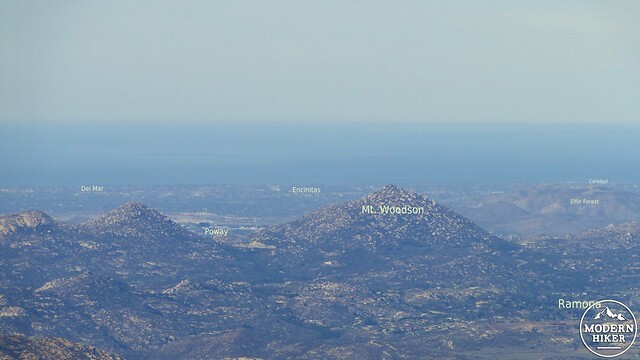 This central location coupled with the elevation makes Cuyamaca Peak the penthouse of San Diego. 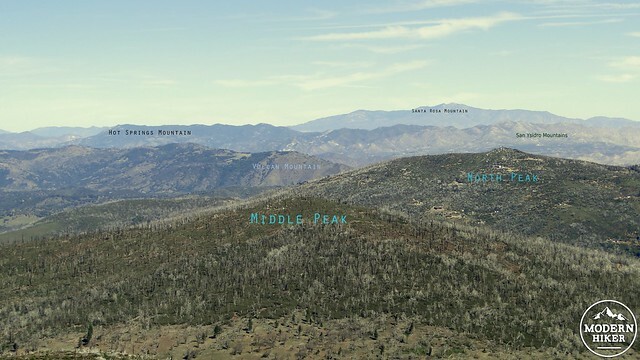 The peak is the dominant landmark in vast Cuyamaca Rancho State Park. This parcel was once covered by a rich mixed-conifer forest, interspersed with chaparral, oak woodlands, and gentle meadows fringed with pines. The land was originally inhabited by the Kumeyaay Indians, who referred to the area as “Ekwiyamak,” which translates roughly to “the place yonder where it rains.” The title is apt as the higher elevations of the park receives an average of over 30 inches of precipitation per year, which supported the forests and gave birth to the Sweetwater River. Consistent with much of the history of San Diego County, the Spaniards arrived and took what land they found most appealing, which was almost everything. This land, rich with animal pasture and numerous water sources, became ranch land until the gold rush brought an influx of white settlers. The nearby Stonewall Mine turned out to be the most productive gold mine in the region, although the boom did not last for long. 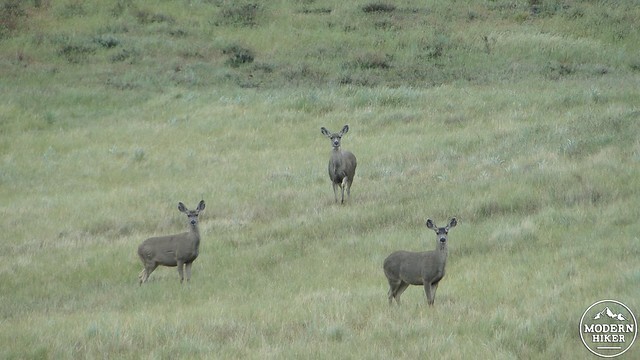 The area surrounding the mine remained ranchland until the state purchased the region and turned it into a state park to protect the vast landscape. You may have noticed that I keep talking about the forests in the past tense. This is because in 2003, the most dramatic and devastating event in Cuyamaca’s history arrived in the form of the 243,000 acre Cedar Fire. This fire, which remains the most destructive in California history, swept over the entirety of the park in its terminal stages. Prior to the blaze, bark beetles and oak borers had decimated the previously rich forest, leaving huge piles of logs and detritus beneath weakened trees. All of this “litter” essentially created one of the largest bonfires the state has ever seen. 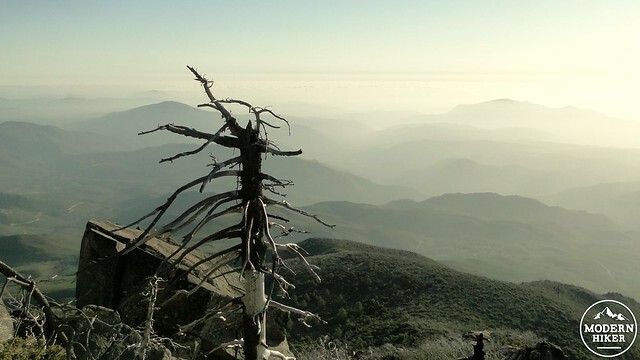 After the fire had rolled through, 95% of Cuyamaca’s coniferous trees had been incinerated, and the seed bank had been so thoroughly destroyed that the forest will not likely make a full recovery unless aided by tree-planting programs. 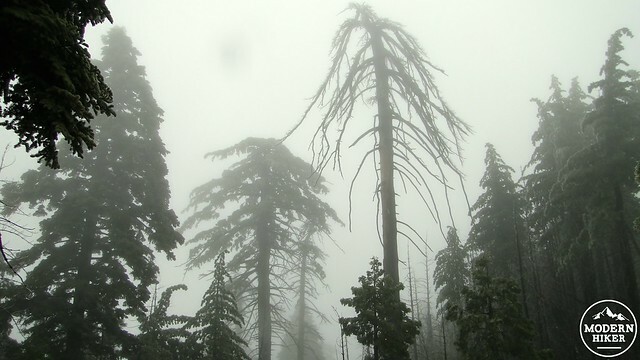 Even more concerning is that the success of the forest’s regeneration is predicated upon whether general climate trends do not continue to diminish the annual average precipitation totals. Climatologists are not optimistic. The evidence of the destruction is omnipresent throughout the entirety of this hike. Therefore, there’s a certain amount of sadness that comes along with hiking anywhere in Cuyamaca State Park, but especially to the peak. 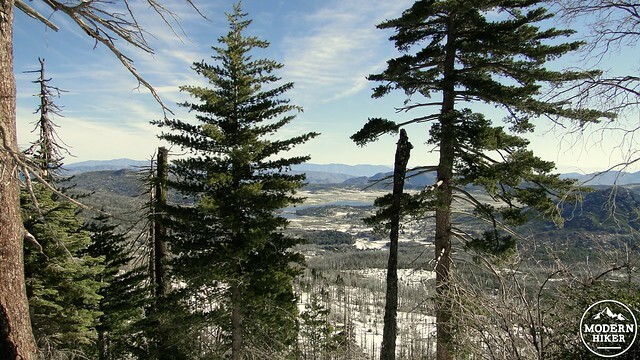 There is one stretch of coniferous forest remaining near the summit, which appears to have survived due to remaining in a favorable position for moisture retention. Here, you can see the few remaining sugar pines, white firs, incense cedars, and black oaks that escaped the inferno. You should also know that the entirety of this hike occurs on pavement. Hiking on pavement can be an uncomfortable grind, especially on the return descent as the pavement intensifies the impact on your knees. A good set of trekking poles can make a difference here, and so can taking it slowly. The one upside of walking on the pavement is that the state park allows dogs on this particular trail, which is a boon for dog lovers. This is the only trail in Cuyamaca that can boast that privilege. The main reason to take this hike then rests with the views. Bolstered by the peak’s central location and nearly superlative elevation, the views range for 100 miles (on clear days) in all directions and take in every major mountain range, peak, urban landmark, and most of the remaining natural landmarks in the surrounding counties. The San Diego landmarks are the most apparent as they are closer, and I recommend bringing a map and a pair of binoculars to spend some time picking out various towns, parks, highways, peaks, etc. The mechanics of the hike are simple. Park at the day use area next to Paso Picacho Campground (which is a fine place to camp) after paying the fee ($8 at time of writing). After crossing through the campground, find the fire road leading to the peak at the back of the campground near the cabins. From here, stick to the asphalt as the road makes its no-nonsense way up the mountain. You will come to junctions with the Azalea Glen Fire Road and the West Mesa Fire Road. Ignore them both and stick to the pavement. As the trail winds ever upward, turn back from time to time to enjoy the emerging views of nearby Stonewall Peak and the Cuyamaca Reservoir. During wet years, the vast plain beyond the reservoir will fill with water, creating a massive, fresh water lake that leaves behind a spectacular wildflower bloom when the water evaporates. As you near the shoulder of the peak, you will find yourself in the aforementioned patch of forest, which is virtually all that remains. Here, you will catch a bit of shade and get a glimpse of what the mountain once looked like. You’ll come to junctions with Conejos Trail and the Burnt Pines Trails, but you can ignore those in favor of trails indicating the summit. If in doubt, stay on the pavement. The road will wind around the east side of the peak and emerge at a small complex of communications towers. There are two separate areas separated by buildings that allow viewing to the north and to the south, respectively. Bring lunch and binoculars, and enjoy San Diego’s penthouse. For those interested in truly bagging the peak, the actual summit is on a pile of rocks sandwiched between two service buildings for the communications arrays stationed up here. The view isn’t as nice as if you take in both “halves” of the view on either side of the service buildings. 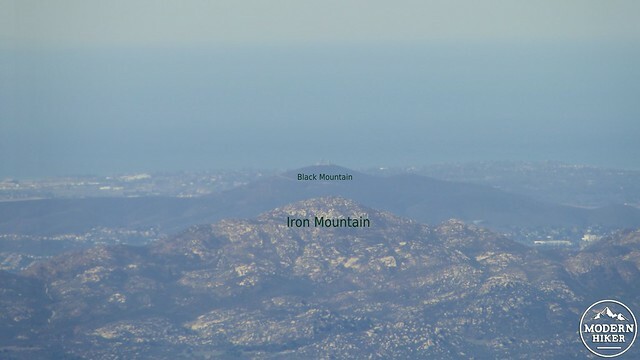 The wider view (on a clear day) takes in the giants to the north, including Mt. San Gorgonio, Mt. 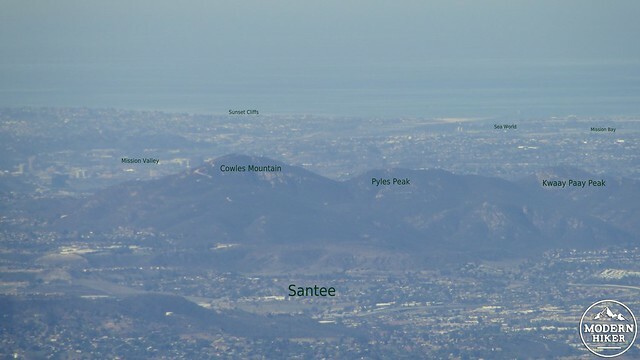 San Jacinto, Santa Rosa Mountain, Santiago Peak, Palomar Mountain, Toro Peak, Mt. 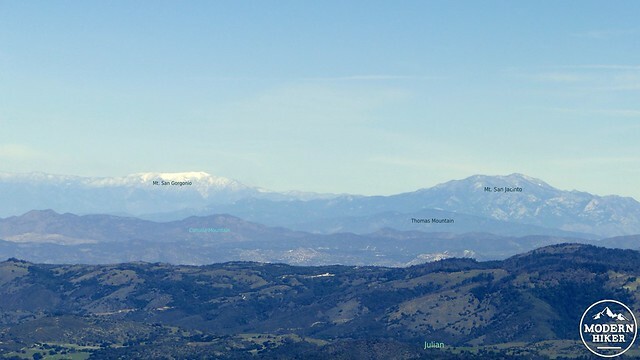 Baldy (and surrounding peaks), San Bernadino Peak, and the rest of the peaks in the distant transverse ranges. The long, cobalt arc of the ocean will shimmer in the distance with Catalina Island punctuating the smooth flatness. 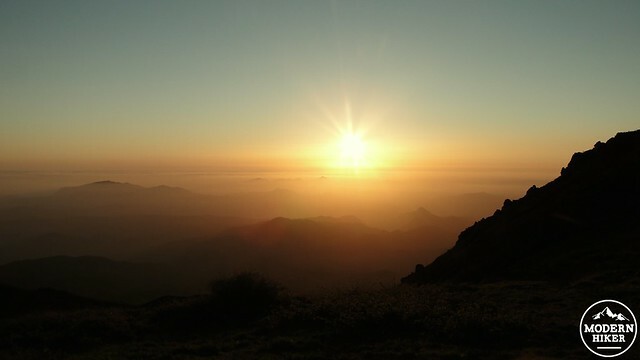 To the east, Anza-Borrego desert, including the Salton Sea and Santa Ysidro Mountains will stretch out into an infinite haze, while the peaks of Northern Mexico brood to the south. It’s an inspiring view, and it more than compensates for the arduous asphalt hike and the presence of so many dead trees. This hike is at its best on clear Fall, Winter, or Spring days after storms have cleared out the air pollution and haze over San Diego. Marine layer days are fun in their way, but there are far fewer landmarks to identify, especially as the marine layer swallows up everything to the north. 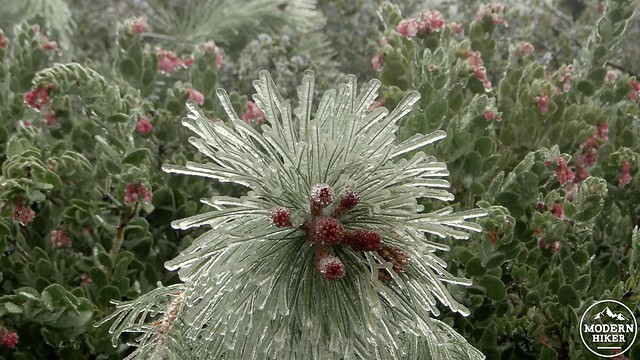 Snow also tends to accumulate and stick for a long period above 6,000’, so be prepared for that should you hike after a storm. This is one of the few reliable snow spots in San Diego, although it rarely snows deep enough to allow for snowshoeing or cross-country skiing. Once you’ve enjoyed the view, it’s back the way you came, sticking to the pavement all the way back to Paso Picacho and then to your car. Cuyamaca Peak is the tip of the iceberg in the eponymous state park, but it is a great place to start exploring this vast, varied region. 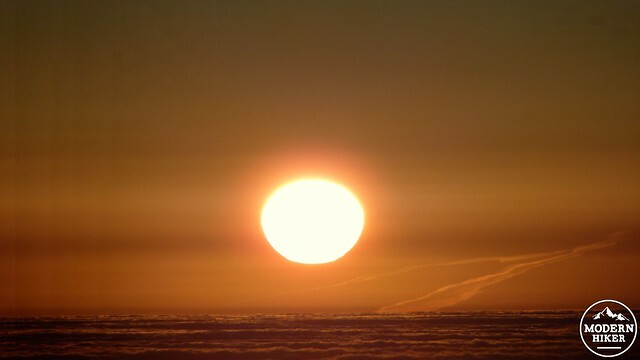 For a real treat, take an evening trek up to watch the sun sink into a sea of clouds or the Pacific Ocean. For hikers who don’t fancy the knee-murdering descent on asphalt, you can follow this alternative route back to Paso Picacho: Turn left on the Conejos Trail and follow it first through coniferous forest and then on a rocky descent along the peak’s northern shoulder. Next, turn left onto Azalea Spring Fire Road and follow that to Azalea Spring. Turn left onto Azalea Glen Fire Road and follow it back to Paso Pichacho. This alternate route is about 1 mile longer than the ascent. The trail is paved from start to finish. It is exceptionally easy to follow, but not entirely pleasant on the knees. 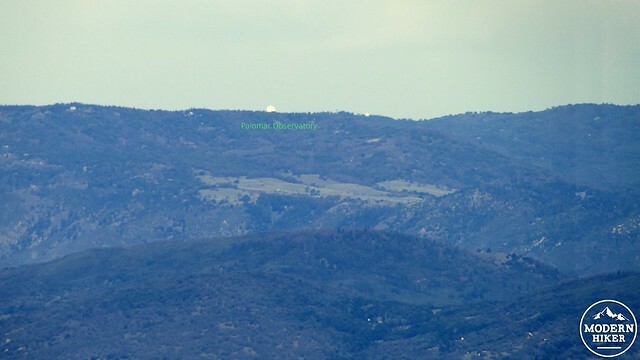 From San Diego, take Interstate 8 and exit at Highway 79 for Descanso and Julian. Turn left, and follow the road until the junction with Highway 80. Bear left, and continue on 79 until reaching Paso Picacho Campground. Park, then walk through the campground to the cabins in the back. Find the trailhead there. Great spot and view as you go higher! As of today, it’s still burned up from the fire. Just walk towards the cabin area up to cabin 70 and you should see the trail with the fire road post. Great description and details of this hike. Including maps and alternate way down. Impressive and thank you! Thanks, Derek! Yeah, I enjoy how the more I hike the more the various landmarks become "old friends." I'd love to take a hike when you get back. We'll keep in touch on the where's and the when's when you're all settled in. Scott, I enjoyed your annotated pics with all the peaks on them. That's what I mentally do when I summit a peak, scan the horizon and see which bumps I recognize. We'll have to go on a hike when I make it down.